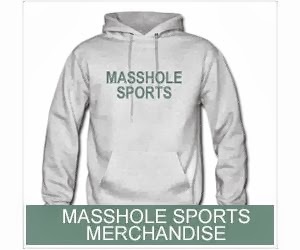 Masshole Sports: REPORT: Gregory Campbell Has A Broken Leg. He Played 47 Seconds With A Friggin Broken Leg! REPORT: Gregory Campbell Has A Broken Leg. He Played 47 Seconds With A Friggin Broken Leg! When it comes to sports, we've seen a lot in this town. But I dont think we've ever seen a player play with as much guts as Gregory Campbell on this play. 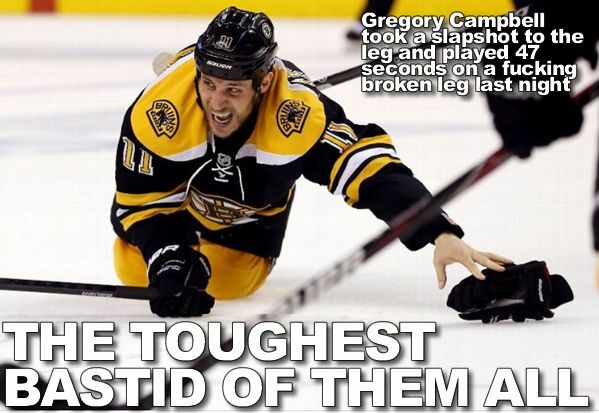 Gregory Campbell took a slap shot to the leg and played for 47 seconds with a friggin broken leg (his right fibula). This has to go down as one of the gutsiest, ballsiest moments in the history of Boston sports. If Campbell had collapsed on that play, like most human beings would have, the Penguins would have had a 5 on 3. They most likely would have scored and we know now that the Penguins would have won this game (considering regulation ended with the score 1-1). So we'd be talking about a 2-1 series lead instead of a 3-0 lead. That changes everything. Im not into ranking sports moments, but I have no problem saying that what Gregory Campbell did is as big as Curt Schilling taking the mound on a surgically repair, bloody ankle. And if the Bruins do go on to win the Stanley Cup, that 47 seconds will be remembered as much as the Game 7 comeback against the Maple Leafs.